The predesigned containers in Visio 2013 expand automatically when you add shapes near the edge of the container. You can change this default behavior by using the Format tool tab of the Container Tools tool tab set: in the Size group, click the Automatic Resize button to reveal three mutually exclusive options. No Automatic Resize The container will not expand when you drop shapes near the edge. Expand as Needed The container will expand when you drop shapes near the edge. The opposite is not true: however, the container will not shrink when you remove shapes. Always Fit to Contents The container will expand and contract automatically when you add or remove shapes. Margins Sets the spacing between the edges of the container and the contained shapes. Fit to Contents Sets the container size to the minimum required for the contained shapes plus the margin. The following graphic on the left shows a different container behavior that you might use from time to time. In contrast to the previous graphic, the wireless access point has not been dragged quite as far into the container. The container signals the difference by displaying a green outline only on the top border and not all the way around. When the shape is dropped, the wireless access point will become a member of the container, but it will be attached to the edge of the container. The key difference in behavior of a boundary shape is that when the container is resized, the boundary shape stays on the border. 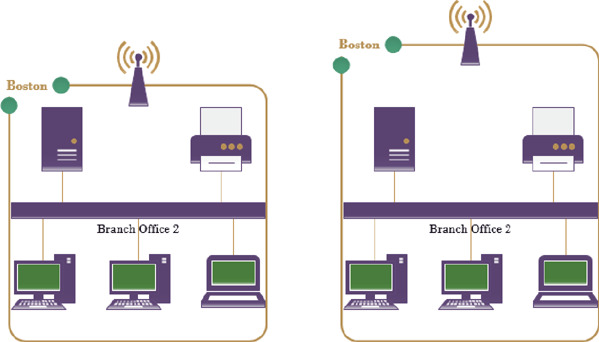 For example, when the resize handle on top of the container in the right-hand image in preceding graphic is dragged upward, the wireless access point remains on the container boundary. 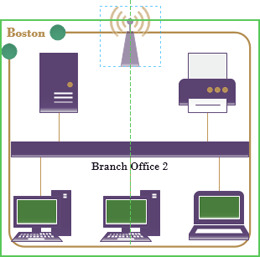 You might use border shapes for a situation like the one shown in this network diagram because the wireless access point is attached to the branch office network but is also linked to other networks. Consequently, it makes sense to show it on the border rather than in the interior of the container.